By the end of this month, the tenders for civil construction works under the Stage Two of UAE national railway network project will be launched as Etihad Rail has completed preliminary designs. The second stage of UAE railway network will extend 605 km from Ghuweifat on the border with Saudi Arabia to Fujairah on the east coast, to be followed by future route additions. To implement this project, on November 27, the UAE Ministry of Finance, the Abu Dhabi Department of Finance and Etihad Rail signed an agreement for the financing of stage two of the Etihad Rail national rail network. “This project is part of our commitment to the UAE to help it achieve a leading position in transport quality, in line with UAE Vision 2021, which aims to transform the emirate’s economy into a competitive knowledge economy by transitioning to a knowledge-based economy, promoting innovation and research and development, strengthening the regulatory framework for key sectors, and encouraging high value-adding sectors. These will improve the country’s business environment and increase its attractiveness to foreign investment. This is why the national railway network serves as a catalyst for economic growth by connecting key commercial and industrial centers and providing a safe and reliable means of transportation for future generations,” said Sheikh Theyab bin Mohamed bin Zayed Al Nahyan, Chairman of the Etihad Rail Board of Directors. The volume of goods transported will increase from 7 million tonnes per year on stage one to more than 50 million tonnes. “The network will help to support future growth with a sustainable, safe, modern and cost-effective transport system, as well as contribute to reducing the number of vehicles on the roads, which will yield tangible benefits from both economic and environmental perspectives. By adopting global standards, the Etihad Rail network will improve the movement of goods and people by creating new trade corridors,” the Chairman said. In 2015, the first stage of the project, which extends 264 km, was delivered, linking the Shah and Habshan gas fields in the Al Dhafra region of Abu Dhabi to the port of Ruwais on the Arabian Gulf, with a capacity of transferring 22,000 tonnes of sulfur granules daily. 20 million tonnes have been carried in total. Etihad Rail is now in advanced stages of commercial and technical negotiations with an extended range of potential partners. 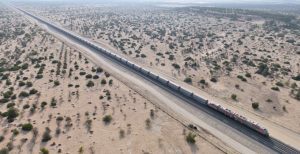 Etihad Rail’s 1,200 km network will extend across the United Arab Emirates, from the border of Saudi Arabia to the border of Oman. The network will run from Ghweifat to Abu Dhabi, Dubai and the Northern Emirates with major connecting points in between, including Al Ain and Madinat Zayed. The Etihad Rail network will also connect with the GCC network and this, once fully established, will cover the GCC countries.